Illinois came ready to play Friday night, and the Illini gave a spirited effort in a hard-fought game. Briefly taking the lead in the second half, Lovie Smith’s team looked much better than they have in recent years. 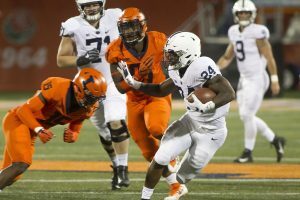 A 26.5-point game-time spread looked like an insult for 3 quarters before the wheels fell off the Illini apple cart. There are clear weaknesses on this team, and it looks like the Nittany Lions will enter Ohio State week with some soft spots they’ll have to protect. The best news Friday night, though, was the coming out party of a running back who’s waited a long time to star in Blue and White. As we predicted in the season preview, the run defense is vulnerable. This was very apparent against the Illini, who had 245 rushing yards. 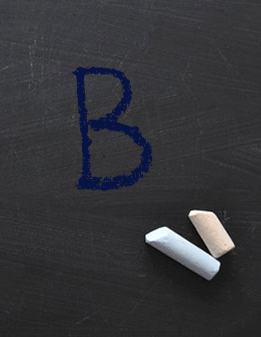 Lack of effective linebacker play at Linebacker U is starting to become critical, and the result is the opponent being able to run the ball. The Lions’ defensive line will get their sacks, but the linebackers have to do a better job filling gaps against the run. DC Brent Pry made some good second-half adjustments to stifle an effective Illini run game, but there were too many points and too many rushing yards against a team with far less talent. Johnson who had a key 4th quarter interception to set up a quick-strike TD to KJ Hamler on the next play to put the game away. Special teams were a non-factor for the most part, with an early missed field goal and two kickoffs out of bounds accounting for the only real errors. Thompkins had a nice 22-yard return to offset part of a 51-yard punt. This was a hard game to judge for the offense, as the passing game was generally bottled until the end of the game. QB Trace McSorley was not very accurate, with several misfires and a lousy interception thrown into double coverage. Drops were not an issue at all, which is great. But the story of this game was undoubtedly the run game. A year ago, the offensive line suffered injuries that essentially nullified Saquon Barkley in the second half of the year. RB Miles Sanders had 200 yards, and RB Ricky Slade broke a 61-yard touchdown in the 4th quarter. WR KJ Hamler caught a nice TD after the turnover. 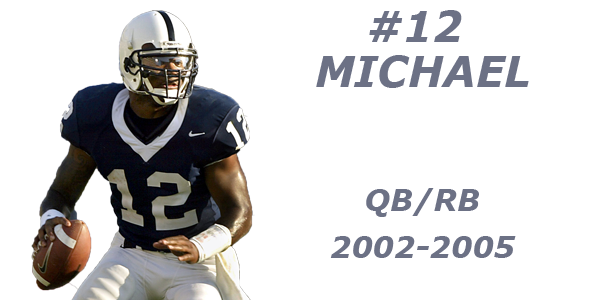 But again, untimely penalties negated scores, including a TD pass from Sanders to McSorley. The offensive line played a great game, and really established an identify for the run game. Jonathan Holland led Penn State in receiving yards, but appeared to again be replace in the second half with Pat Freiermuth. 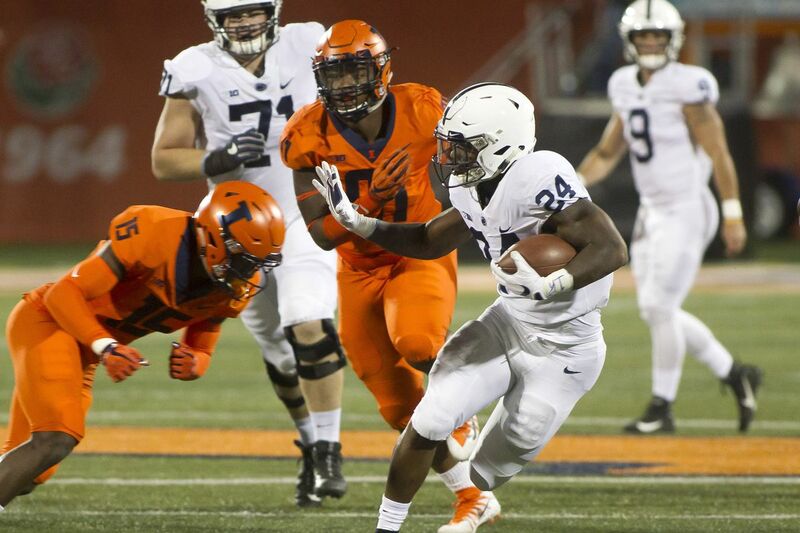 Miles Sanders continued his impressive start to the season, turning in a 200 yard, 3 touchdown performance against Illinois on Friday night. This was an easy one, as Sanders is coming into his own, pushing piles, waiting, accelerating and his running style really compliments the strength of an offensive line that is improving every week. Still some undisciplined penalties, but a return to the 2016 model of being a second-half team. A 35-0 slammed the door on the Illini. 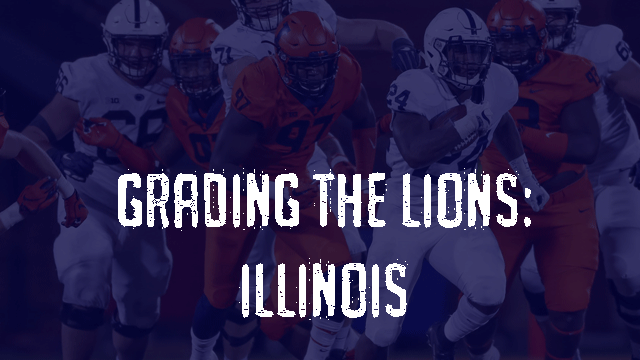 Second-half adjustments on both offense and defense were extremely effective, stopping the Illinois running success they enjoyed in the first half. Having the team come out focused on a short week for a late Friday night road game was no easy task. They’ll have to play cleaner against the Buckeyes and maintain a balance between the pass and run games.